The Grinder: CrossFit FRAGO #8, "SHANE"
(1) Intent. Complete as many rounds of the exercises in 20 minutes as possible in a safe manner. This is a four-person-team team "time-specific" workout. The purpose of this workout is to develop cohesion and combat fitness under fatigue conditions through shared hardship, challenges, and competition. (2) Scheme of Maneuver. The platoon will be divided into as many teams of four as possible. 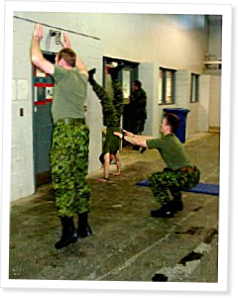 Each team will require a wall or other stable object to conduct the inverted burpees against. All teams will start at the same time. Each exercise must be completed before moving to the next one (all 8 inverted burpees must be finished before starting the squats and all squats finished before starting the burpees). The soldiers can take a rest at any time during the workout. Each team has to complete as many rounds as possible in the 20 minutes. The total number of complete rounds for each team member will be added together to obtain the total score for the team. For example, if soldier "A" completes 12 rounds, soldier "B" 15 rounds, soldier "C" 13 rounds, and soldier "D" 9, the total score for the team would be 49. Spotting is not permitted at any time. (3) Main Effort. The safety of all personnel, and the development of unit cohesion and combat fitness through shared challenge and hardship. (4) End State. The safe and successful completion of all exercises.